Our Janitorial and Food Service Featured Products are specially selected by our team of experts to bring value to your business. Learn more about each product's unique features that help you reduce costs, labor, and time. Contact us for a product demo or order online. 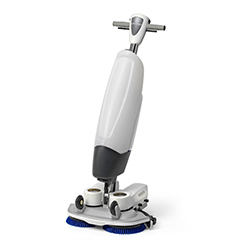 View more Floor Scrubbers and Janitorial Equipment. The versatility of a flat floor mop combined with the power and efficiency of an autoscrubber. Extreme Mobility - powerful floor cleaning solution that scrubs and dries with the 360-degree mobility of a flat floor mop. Increases Productivity by 40% - rapid-change cleaning system with replaceable tanks integrated into the cleaning trolley. Cordless, continuous operation with quick-change lithium-ion batteries providing 1½ hour runtime with 800 cycles. Water-Efficient - 1 gallon of solution cleans approx. 4,300 sq. ft. saving you time and protecting the environment. 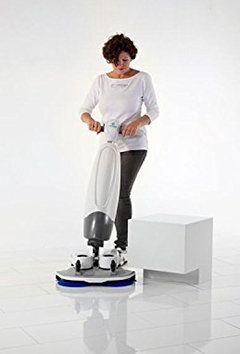 Ergonomic Revolution - lightweight design to easily clean under tables, chairs, counters, and other furniture with a hovercraft gliding experience. Maximum Sanitation - prevents spreading dirt while cleaning for a more sanitary and healthy environment. Includes clean water tank, recovery tank, two brushes, two batteries, battery charger, and squeegee set. Lease-Finance the I-Mop for only $99/month! Contact us for a demo and more details. Subject to credit approval. Only applicable to businesses open three (3) or more years. $99 per month for 60 months with $1.00 buyout plan. Two (2) payments due at signing. Learn more about our Lease-Financing Plans. VIDEO: Watch the power and flexibility of I-Mop! Reduce absenteeism at your business with a complete hand care system. Contact us for a product sample or order online. Small, stylish, and versatile for every need. Multiple mounting options (wall, surface-top, and railing mounts) that allow you to place in small, high-traffic areas that can’t fit other solutions. Kills 99.9% of germs while maintaining skin moisture. Visible, at-a-glance product level monitoring for easy servicing. Sleek, gem-like design that adds style to any casual or upscale setting. Refill cartridge contains almost twice as much product as a standard 8 fl. oz. Purell pump bottle. Did You Know? 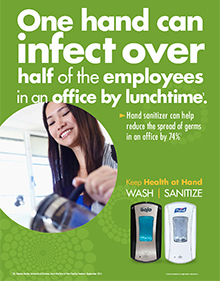 A study conducted by GOJO found that customers perceive a display of hand sanitizing systems as proof that a business cares about the health of their guests and overall cleanliness. 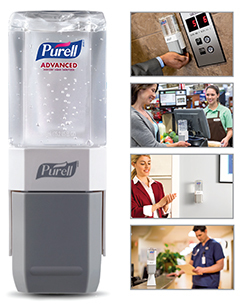 View more features and benefits of Purell ES. VIDEO: See how Purell ES fits everywhere you need for the health and well-being of your customers and occupants. 3 Simple Ways To Prevent Getting Sick This Winter! View more Sweepers and Janitorial Equipment. 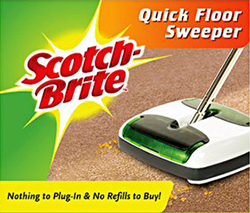 Great time-saving alternative to traditional sweepers. No carrying heavy and noisy vacuums for in-between spot cleanings. Picks up hair, lint, dust, and small to large debris. Oil-resistant, easy-clean materials enables easy food cleanup. Dual rotation "toss & trap" design makes cleaning faster. Nothing to plug in and no refills to buy. Top-loading tray for easy emptying. Rubber blades are safe and effective on all floor types including carpet, hardwood, vinyl, and tile. VIDEO: Watch how quick and easy in-between spot cleanings can be with floor sweepers! View all of our Filmop cleaning and microfiber products. Ergonomically designed, lightweight hand-held mop head helps eliminate wrist strain by decreasing the amount of hand rotation and pressure needed. Hand-held mop head incorporates a plastic scraping edge to remove dried food or hard to remove residue. High performance microfiber pads that attracts and holds onto dirt, grime, and cleaning solution, resulting in superior cleaning and streak-free drying, even on stainless steel and glass. Large pad and mop head surface area reduces labor by allowing a 12” or 16” area to be cleaned in one swipe. Maintains complete surface contact for more effective cleaning and evenly distributed pressure assures cleaning solution is applied consistently with less effort. Washable microfiber pads that reduce waste. Pads are securely and easily attached with velcro strips. Works on any flat surface including windows, mirrors, tables, and cabinets. VIDEO: Brilliant clean in just one wipe - see how! FACT: Backpack vacuums save time! According to ISSA’s 540 Cleaning Times, vacuuming 1,000 sq. ft. with a backpack vacuum takes only 8 mins. — 62% less time than an upright vacuum that cleans the same space in 21 mins. Contact us for a demo or order online. View our flexible, tax-deductible lease-financing plans. 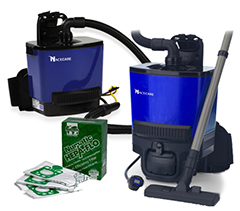 See more Vacuums and Janitorial Equipment. Quiet, time-saving alternative perfect for daytime cleaning. Superior mobility and speed allowing you to clean more carpet and flooring quickly. Compact and lightweight with ergonomic features - back support, waist, and shoulder straps designed to minimize operator fatigue. Excellent soil recovery and suction - powerful 1.6 Hp vacuum motor for longer carpet life. Standard 4-stage filtration system can be used with or without a bag. Tangle-free operation - hoses feature swivel fittings to ensure tangle free operation. 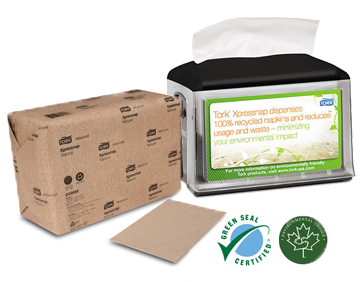 Improved indoor air quality (IAQ) with excellent 0.3 micron HEPA filtration at 99.97% efficiency with or without bags. Seal of Approval from the Carpet & Rug Institute (CRI) guaranteed to result in cleaner, long-lasting carpet and improved indoor air quality. 250 watt vacuum motor with run time of 45 minutes ensures there is plenty of power and operational capacity and 1.5 gallon tank provides the capacity required to do the job. 36 volt lithium ion battery charges in 2.5 hours and can be interchanged with NaceCare canister units. At 16 pounds the RBV130 is compact, comfortable, and light enough for anyone to use. Excellent soil recovery and powerful suction no matter how full the bag is - patented ribs on the inside of the tank prevent the bag from sealing against the sides and cutting off the flow of air and suction. VIDEO: Watch the RBV130 Battery Backpack Vacuum at work! Low-flow, consuming 12% less water, sewage, and energy than the industry standard 1.42 gpm (5.4 L) nozzle equaling a $450 savings per year. Infinite choice of spray patterns (soft hollow cone to a powerful solid jet stream) available at the squeeze of the trigger. Vari-Spray flow rate: 1.25 gpm (4.7 L) at 60 psi (4.1 BAR). The only single-piece nozzle on the market (no welds = no leaks). No need for a separate handle. All stainless steel operating parts vs. industry standard plastic & chrome-plated brass. Durable rubber (no cracking plastic). Buy one Vari-Spray for every three or four competitor’s nozzles in any 5-year period. 2-year warranty versus the industry standard of 1 year. VIDEO: Watch the superior performance of Vari-Spray! 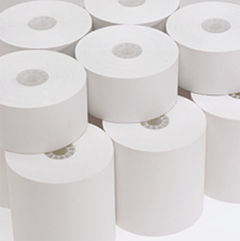 Click the below image to view a product listing of register rolls & printer ribbon. Use for cash registers, credit card machines, mobile printers, and more. THERMAL, BOND, or CARBONLESS? 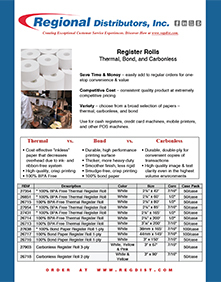 Find the right paper for your exact use! Design Your Own Ad Online! Easily design your own ad or choose from hundreds of templates online! SCA has been recognized by the World Wildlife Foundation (WWF) for leadership in transparency for disclosing their ecological footprint in the 2013 WWF Environmental Paper Company Index (EPCI). Learn more. Click image to view size options. 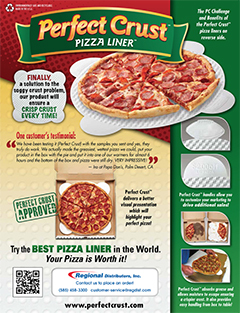 Eliminates soggy crust by absorbing grease and moisture allowing for a crispier crust. Retention value keeps pizza 12-15 degrees warmer upon delivery. Patented bumps help keep pizza more stable in box during delivery. Handles allow for customized branding and marketing to drive additional sales. Move pizza with ease using convenient handles. Better visual presentation of pizza. Uses less storage space than corrugated liners. ​​VIDEO: Andolini's Pizzeria sums up the cost-saving and space-savings benefits best! Our commitment and passion for protecting the environment and promoting green products, technologies, and practices has rewarded Regional Distributors with an extraordinary energy savings of over 50% owed to our implementation of LEED designed features within our 60,000 sq. ft headquarters. Visit our Regional Working Green page to learn more. "When choosing a supplier, price is always one of the key factors that determines who will receive the business. Regional isn't only the company that has the best value, they also provide invaluable recommendations for highly efficient products and green alternatives. Dave Scalen (Vice President, Regional Distributors) goes out of his way to help each of our dining units evaluate their needs and provide specific products that work best. He also helps the campus dining operations with various green initiatives and recycling efforts. If you’re looking to make a change in paper supplier, I highly recommend Regional Distributors."